Last night, for what I think was the first time ever, I purchased a book because of a blurb. Okay, it was an eBook on sale for $1.99. And I have a gift card on file with Amazon, so it didn't cost me anything. But still. 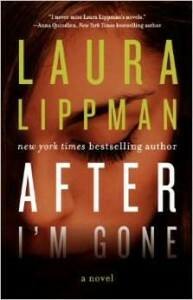 The book was After I'm Gone by Laura Lippman, someone I hadn't heard of. But it was a mystery, which is sort of my reading genre, and, as I said earlier, it was only $1.99, and I wasn't even going to have to pay that because of that gift card that I also mentioned before. Plus the author has a lot of published work, so if I liked this book, I would have her backlist to draw on. All compelling reasons for a purchase. I went to Lippman's Facebook page (evidently some people do go to author Facebook pages), and I see this: "Laura Lippman is one of my favorite writers. I cannot focus on anything else when I am reading one of her books. Her writing makes me wish I lived a sexier and more violent life." Mindy Kaling. It was the "wish I lived a sexier and more violent life" part that sold me. I'm not Mindy Kallng, but I love Laura Lippman's books and they're really the only mysteries I read these days. They're my favorites to listen to when driving, with great readings by Linda Emond. I hope you like this. I'm really psyched now. Last summer I binge-read Tana French's "Murder Squad" books. Lippman has more titles, both stand alones and series. That would be a serious binge.